Beautiful – Our covers are elegant looking and will surely add to the aesthetics of your outdoor living area. 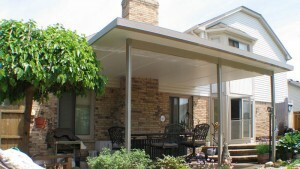 Low-maintenance – Manufactured with an electrostatic finish, your new porch cover will be exceptionally easy to clean. Durable – You won’t have to worry about your shade solution rotting or falling victim to insect infestations. Additionally, our skilled and experienced technicians will be able to install your new shade solution for you in a timely manner so that you can begin enjoying your new porch cover as soon as possible. If you would like to learn more about adding a beautiful and long-lasting porch cover to your home, contact U.S. Patio Systems and Home Remodeling today. Our specialists are available to answer any questions you have and can tell you more about the top-notch products and services we offer to homeowners in Minneapolis, MN, and surrounding communities.